A series of tools Gary has created for hundreds of his workshops and training, designed to help teams generate ideas or quick pitches from assigned stories/genre/intention/business etc: You will need Shockwave and/or Flash players installed into your browser to view these – get it from Adobe here. TRANSMEDIA-BRIEF-O-MATIC – FLASH “This randomly chooses (on command) story/TV worlds and two simple ‘objectives’ to take into account in your presentation back. There are two sections TV extension and pure Transmedia. PITCH-O-MATIC – SHOCKWAVE “For students & media professionals to develop their ‘off-the-cuff’ pitch and presentation skills”! GAME GENERATOR – SHOCKWAVE “For teachers and students to come up with the seeds of a new game”! TWEETOMATOR – SHOCKWAVE “For tweeters who are sometimes lost for things to say”! SOCIAL MEDIA BALANCE – requires you to maintain and grow a user based community by carefully clicking at the right times across social media and PR releases! 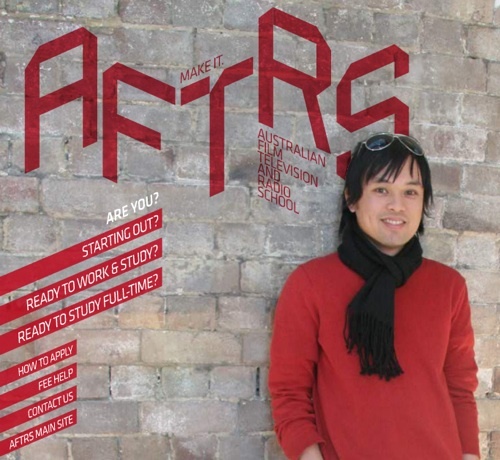 “Make Games and Virtual Worlds at Australian Film, TV and Radio School” – OK time to wear that other hat as Director of the Laboratory for Advanced Media Production at AFTRS and plug some of the cool new courses we are delivering in 6 months time. Discover new opportunities to express yourself in an exciting collaborative environment where film meets game worlds. Build your knowledge base on strong foundations of cinematic storytelling, gameplay and virtual environments. I have been in this LAMP role for over three years now (wow, that long!) and the changes I have seen taking place in AFTRS, a 30 year old establishment, with a new CEO and the move to a sparkling (read: still fixing the place up!) new building are utterly transformative. This new environment has had a positive effect on the desire for Australia’s leading linear ‘story production’ establishment to also become Australia and the world’s leading trainer in cross-over, game/film worlds, is a delight to see. A range of traditional marketing initiatives will kick-in over the next few months with roadshows, open days and printed press but no doubt the blogosphere will start to reverberate with excitement as a few ‘web 2.0 friendly’ staff trickle the news out to ‘trusting’ recipients. There are some useful details (also copied below) from the MakeIt prospectus site about the game and virtual worlds courses, and yours truly as a lead creator in virtual worlds and other game spaces, is heavily involved designing these and others. Also other emergent cross-media forms will continue as they have done over the past 2 years at AFTRS and these include Cross-Media Storytelling, Social Media Entertainment, Episodic Drama and Participatory TV. Rather than be ‘extra’ modules though, this time they will be embedded into the many ‘heritage’ areas of the curriculum such as Directing, Screen Studies, Sound and Writing making for a truly integrated cross-media development approach. Things are changing fast here and nice to be a part of positive ‘change’. OK some ‘new’ course detail. 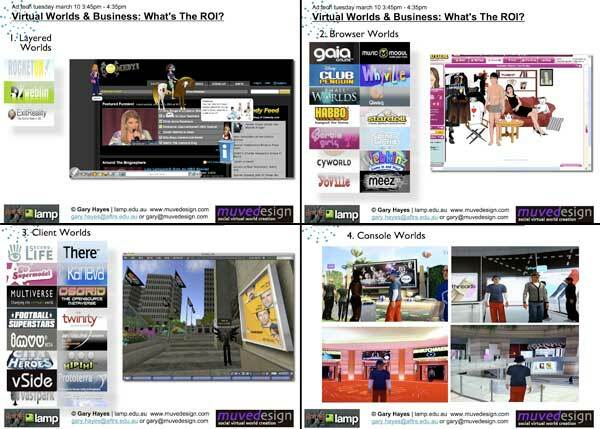 First, Virtual Worlds…there are no direct links on the micro-site as it is a flash movie but here is a link to the other ‘web 1.0’ site course description. This multi-disciplinary course develops the skills and understandings necessary for constructing computer generated story worlds for use in a broad range of media industries. Project work will include pre-visualisation sequences for film or TV, virtual spaces for use in massively multiplayer online games and social virtual worlds and rich environments for CG animation or machinima. Throughout this 32 week course students will work on several practical projects including a real industry brief. Through lectures, demonstrations, masterclasses, and industry guest speakers students will investigate areas such as Cinematography, 3D set and landscape creation, Voice Over Scripting and Production, Lighting, Team Production, Character Animation, Game Play and Sound and Music Design. This course provides opportunities to develop creative ideas and projects in a multi-disciplinary environment. This module explores new opportunities for storytelling using machinima (a hybrid of ‘machine’ and ‘cinema’), a technique to create movies by using video games as virtual film set. Sound and music are important aspects of developing sophisticated story worlds and help to and immerse the participant in any virtual environment. This course explores the potential of interactive sound. Pre-visualization serves two primary purposes — to sell a concept and save time and money. Also pre-visualization is becoming an end in itself and the cross-over with high production value machinima is investigated. Understanding virtual space as being heavily linked to story and also integrated with the film story or game and social characters within it followed by machinima workshop. Designing Social Spaces require cross-over skills between town planner, web designer and psychoanalyst. These particular worlds range from cartoon cut out grids on web sites through to fully immersive photo-realistic spaces. The Production Project is the means for students to apply the skills, understandings and ways of working they have acquired in undertaking other Graduate Diploma units in their area of specialisation. The Production Project Module may take the form of a group or individual project or industry attachment and is intended to enable students to utilise their creativity, imagination, skills and knowledge in their area of specialisation. This unit is designed to develop the skills of brainstorming and rapid creative project development. Flexibility and adaptability in creative teamwork are a focus of this unit. Students learn to work to a brief under time pressure and develop skills in the visual, written and oral presentation of ideas. and of course Games Design – again a link to the main site details here. This intensive one year course enables students to develop the practical skills necessary to design games. Game Design offers a unique mixture of practice and theory developed and taught by industry experts, mixing classwork, workshops and production opportunities in a creative multi-disciplinary environment. 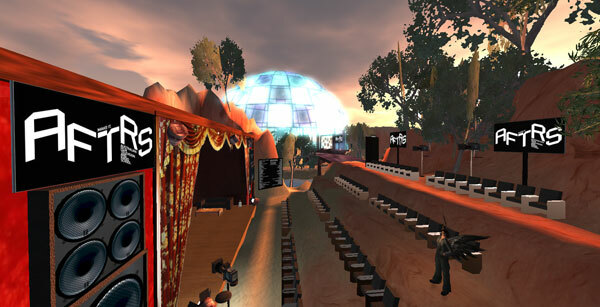 Students are encouraged to build a course that fits their passions, skills and needs through a structure that allows each student to create a unique specialist pathway by a combination of core and elective subjects, including subjects from new Graduate Diplomas in Virtual Worlds, Animation Directing, Directing (Fiction and non-Fiction), and then put that into practice. Through lectures, demonstrations, masterclasses, and industry guest speakers, students will investigate areas such as narrative space, character, performance, fundamentals of gameplay, and creative leadership necessary to design games. Work in teams to develop a short production from idea to fine cut. Work individually or in teams to create an original work. Students are encouraged to form teams with students from other disciplines, depending on the needs of the project. In addition, students will share Screen Studies units with other disciplines, including genre studies.